I baked 2 different loaves today; Toasted Walnut Bread (page 322) and Fig and Walnut Bread (page 340.) I am combining the two and just doing one post. I can’t eat nuts, myself, so both of these loaves will be “gifted” to others and I will have to get their reviews added to this blog post later. Early this morning, I started the Toasted Walnut Bread. According to the cookbook, this recipe was a clipping from a Fleischmann’s Yeast Ad in a magazine. The first step in making this bread was to toast 1 cup of walnuts. In a 350 degree oven, this took only 4 minutes. Then I set them aside to cool while measuring my other ingredients and starting my bread. Into the bread machine, I added 1 1/3 cups water, 2 lightly beaten egg whites, 2 tablespoons of butter (cut into pieces), 4 cups bread flour, 3 tablespoons sugar, 3 tablespoons nonfat dry milk, 1 tablespoon plus 1 teaspoon gluten, 1 teaspoon salt and 2 1/2 teaspoons bread machine yeast. 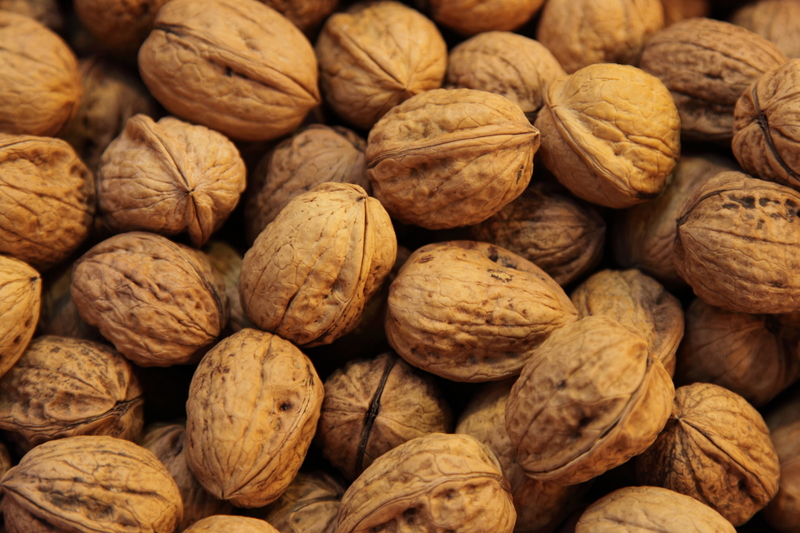 (The walnuts were added later.) I used the basic cycle and medium crust settings. Between the 1st and 2nd knead, my machine beeps, and that is when I added the, now fully cooled, walnuts. I used the ingredient amounts for a 2 pound loaf instead of a 1 1/2 pound loaf this time. I probably should not have done that. My machine isn’t quite big enough for a 2 pound loaf. (Or this bread just rose like mad.) I noticed during the final rise, that the dough was already touching the top window of the machine. I removed some dough with a spoon and discarded it. I still ended up with a large loaf of bread, but the top wasn’t as smooth as it might have been. Since I made two loaves today, I am going to take the time to mention now how to best clean the pan and blade of your bread machine. Always try to hand wash the parts of your bread machine. The coating on the pan will stay nicer, much longer, if you don’t use the dishwasher. The second loaf is a Fig and Walnut bread. This recipe is in a special section of the cookbook that delves into using boxed bread machine mixes and creating specialty breads from them. I purchased a Krusteaz Country White Bread Mix. Along with the mix, I put 1 cup of water, 2 teaspoons of gluten, and the yeast from the box into my bread machine and set the cycle for basic and dark. While the dough was starting, I chopped 1/4 cup of walnuts and 3/4 cup dried figs. When the machine beeped between the kneads, I added the fruit and nuts. I am really wishing I had taken photos today, I will have to get back on that with my next loaf. I checked the dough regularly, just to make sure I wasn’t getting another crazy big rise. As the figs were kneaded into the dough, the seeds spread throughout the loaf and it looked so pretty in the pan. I am looking forward to hearing how the bread looks after it has been sliced. As I said before, I can’t eat these loaves. So once they were fully cooled, I wrapped them well and put them in the freezer. I will be seeing some friends this next weekend and asking them to take a loaf home and let me know what they think. When I get the taste test results, I will add more to this post. 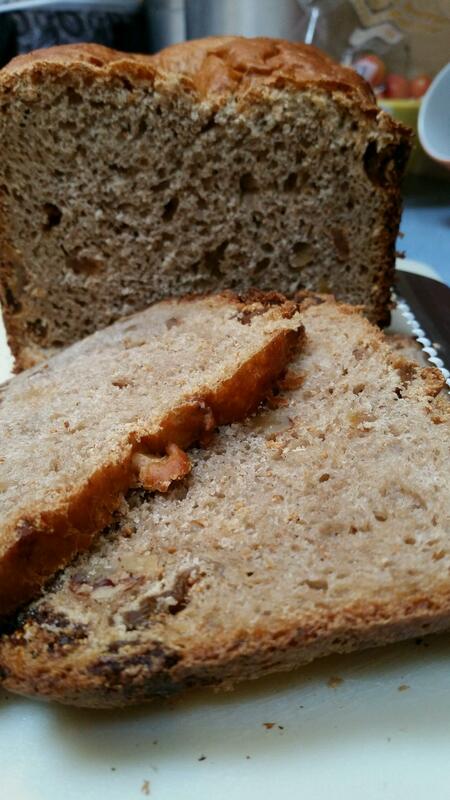 I sent the toasted walnut loaf home with my friend, Jennifer to share with her family. The results? My sister got the fig and walnut loaf because I know how much she loves figs. We were lucky enough to take a trip to Dubai a few years ago and got to try fresh figs for the first time. Becky is now a fan of the fig. In addition to trying it herself, she took it in to work and asked for people’s opinions. 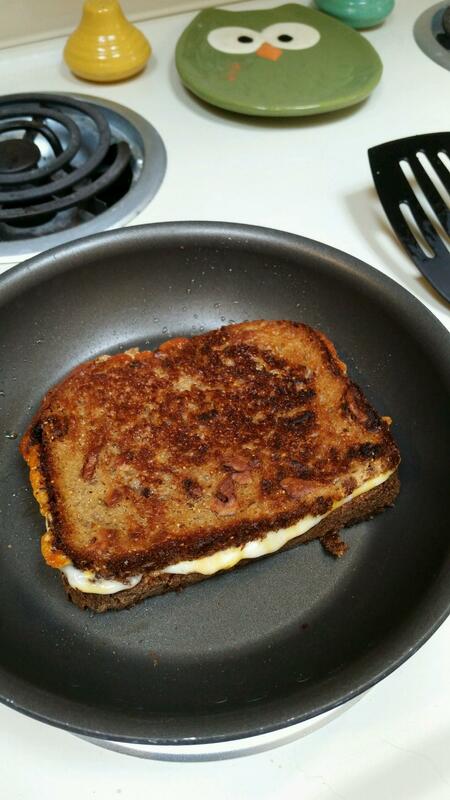 Before that, she made herself a toasted cheese sandwich and took a couple pictures for this post. ” Smells wonderful. Looks nice and dense. The fig has a nice little kick of sweet you aren’t expecting. So the consensus, tasty, but dry. I can either attribute the dry texture to having frozen it after baking or the fact that this recipe called for a boxed bread machine loaf instead of making it from scratch. I may try adding the fig and walnut to a from scratch white or whole wheat loaf at some point to see if it is any better. Waiting patiently for the final reresult.